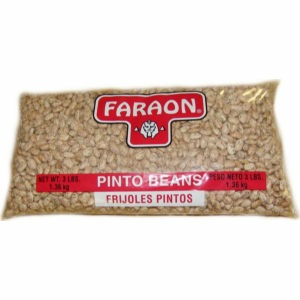 Faraon pinto beans are delicious, healthy and good for you! Our convenient three pound bag is great for weekly use and an excellent value. Well known for its nutrition, protein and fiber, Faraon is a great compliment to any dish. No cholesterol, fat or trans fat. All Faraon quality beans are carefully selected and packed using a special process to ensure your satisfaction. No wonder they say "Que Ricos Son! tm", they're so delicious!